Apparently I’ve come full circle. I’m back to eating baby foods! This soup was delish! I can’t find where I got this recipe to give credit, so what I did is at the bottom of the blog. Wow. What a year it’s been. On the way to my 3 month doctor’s appoint to visit my naturopath, my husband and I realized it was one year ago to the day that we were in Chicago at the Chicago University Celiac Center. We thought back and considered just how much God has molded us since that time last September! Praise and glory to Him alone. That’s not to say all of western medicine is bad or wrong, we just need to be aware that being your own advocate, and listening to your body trumps any other “study” out there, especially when we’re dealing with disease. Any wise doctor knows that. God only made one of you! The word Celiac itself means “abdominal” – and they’ve known for over 100 years that the problems that stem from your gut can be affected by diet, and the destruction is systemic and causes countless issues, including your brain to break down. (Although one of the reasons brain damage wasn’t suspected earlier, is because you don’t have pain receptors in your brain, so you can’t FEEL that inflammation!) Even though a lot of this information appears new, it’s not. While gluten sensitivity is just now being talked about, apart from celiac disease, and part of that has to do with our heavy GMO carb diet, celiac disease has been acknowledged since the late 1700s. Celiac is considered the “most severe” level of abdominal disease, but I really think if you’re someone with another type of auto immune disease or cancer – you might disagree. To me, all are severe, and clearly if diet turns them off or on, they are also preventable. Every bite and sip we put in does impact our gut health, so does stress, sleep and exercise. We can either choose to ignore that and get sicker and sicker, or make changes to improve that. I’ve been reading and learning a lot lately, and I’ve also been struggling a bit with additional bloating and pain right around my stomach area every time I eat. Enough to finally mention to my doctor that I suspect a SIBO (Small Intestine Bacterial Infection), which is very common with celiac disease. So we started a new plan of attack on my gut, which includes some HCI with meals and some DHL Plus. I’m also taking some Peppermint and Oregano Oil to get this bad-boy to simmer down and heal. I’ve already seen improvement. I won’t lie that all of this inflammation this past two years is concerning to me. I don’t want to put my head in the sand and pretend I don’t know what inflammation causes… because we all know it’s a breeding ground for cancer in the body. So, after seeing some other encouragement on natural cancer treatments, I inquired with my doctor about screening for things like colon cancer in my body. She recommended a simple blood test called a CEA (Carcinoembryonic Antigen) test. This will measure the protein in my blood for certain types of cancer (specifically colon), and will help give me some peace of mind while I’m working through this. I know in my heart I would treat things naturally regardless, but I can’t treat things if I don’t know what is going on! Full of FAITH, not of fear. I hope you’re enjoying this beautiful fall day and the sun is shining where you are! Keepin’ it Healthy for Him! In large soup pot, melt coconut oil, then add carrots and onion on medium heat until tender. Add broth, heat to boil and then simmer for 10 minutes. Stir in spices, and milk and then pour soup into LARGE blender and process until smooth. ** Organic carrots are a GREAT cancer fighter!! 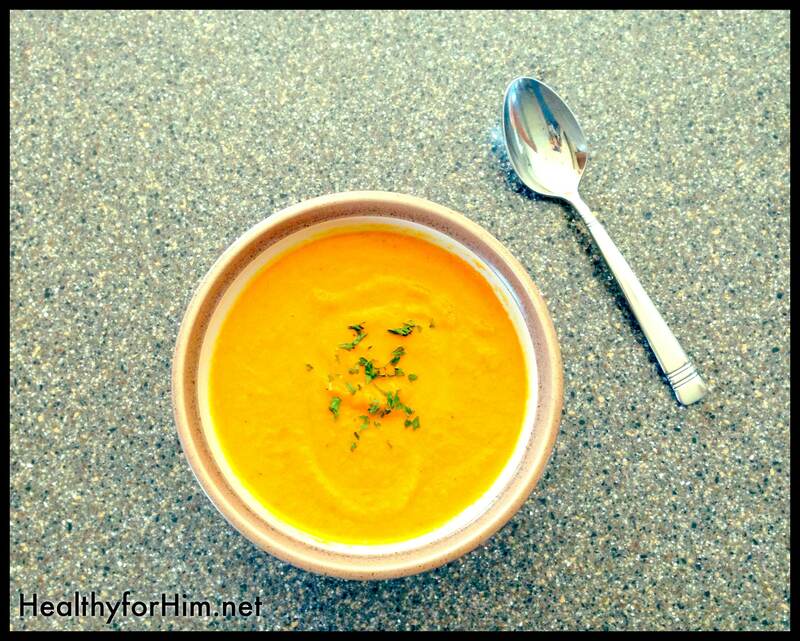 Posted on September 29, 2013, in Auto Immune Disease, Celiac/Gluten Sensitivity, Our Struggles, Truth and tagged auto immune disease, carrot soup, celiac disease, colon cancer, DREAM BIG, fighting colon cancer naturally, gluten intolerance, healthy for him, MS, paleo. Bookmark the permalink. 4 Comments. Soooo true!!!! And– We are having a totally awesome day here in the Ozarks– & we had a wonderful almost inch of rain last night that we needed badly!!! It feels like Fall– in the air—I Love this time of year– as I don’t do well with the Summer heat any more!!! Thanks for sharing great info again!!!! Beautiful!! Sounds amazing Sonda! 🙂 I agree, I like mild temps. I don’t do well in the super cold though – Saturday soccer quickly reminded me of that. The adrenal fatigue kicks in majorly! I’m thankful for a short season and HEAT inside! !